Meet the next generation of compact garden sheds that make an impact on any sized backyard. EasyShed’s variety of Narrow Slider garden sheds will help brighten up your backyard with a crafty design that allows homeowners to find a quick and easy solution to all those clutter problems. Fitted with industrial grade sliding doors to avoid encroaching on your yard space. This 2.25m wide x 0.78 deep x 1.95m high narrow slider storage shed comes with a 0.66m sliding single door, positioned on the 2.25m width making it an ultimate storage solution. The roof slopes down from back to front, with a 1.8m high door wall height. 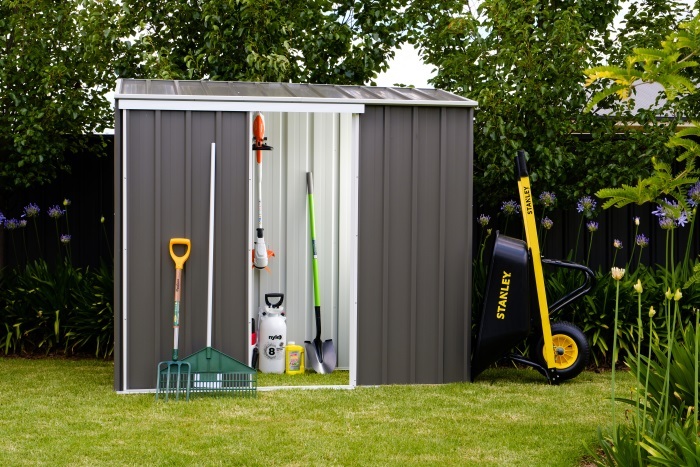 This storage shed fits under eaves and is large enough to store tools, sporting equipment, lawn mowers etc. The door is braced to ensure the integrity of the shed structure and is designed to allow easy access to your shed’s contents. The sloped or reverse skillion style roof is ideal for fitting into tight spaces, and maximising storage at the back of your shed. EasyShed’s sheds are built from strong hi-tensile BlueScope steel, meaning they’ll brave the harsh weather conditions that Australia has to offer. This is further backed up by a lifetime warranty. Buying direct from the Australian manufacturer means you get the best price on the market too.